is a P2P Online streaming on all your favorite trackers/sites! Innovative technology of playback of streaming audio and video created on the base of the most popular P2P protocol (BitTorrent), in its best in the world realisation, with unsurpassed possibilities will allow you to enjoy online viewing and listening to the highest quality video and audio in the Internet. Take advantage of possibilities and functions of the Ace Stream System by connecting Magic Player extension/addition for your browser, and you will not have to make different unnecessary movements and wait for something to download! By pressing only one "magic" button, when you are on your favorite tracker/site, you can start an online playback of video or audio content without downloading the torrent-file or waiting to load the content. You can also enjoy the benefits of technology and new opportunities when you visit the most popular news sites and video hosting, i.e., imdb.com, kinopoisk.ru, YouTube, Vimeo, RuTube , etc. But it will be later, so be with us and watch our news online or via Twitter. Learn about the functions of the Magic Player extension, as well as guidelines and recommendations and other useful information in the relevant sections. The information about the Ace Stream System can be found on its official forum. This extension provides online playback of video/audio content through BitTorrent protocol on all most popular websites/trackers and also extends the basic functionality of websites that you use with the help of innovative technologies. 1. Adds a context menu item that can be used for online playback of video/audio using links to torrent-files posted on any trackers/sites that you have visited without the need to download torrent-file itself and waiting to load the video/audio content. Context menu item only works if the current link leads to torrent-file, i.e., extension ".torrent" and correct MIME-type. 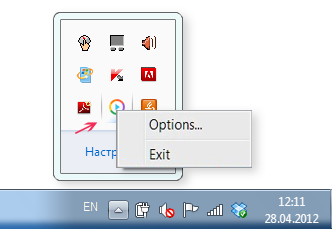 In browser Opera this function is not available yet. 2. Adds special/magic button or built-in player to the most popular trackers (any sites that contain links to torrent-files), clicking on which will provide online playback of the content, which is presented in the release, in its original quality. 2. Displays sites via "10-foot UI" interface for comfortable navigation and viewing its content on the big screen, TV with the ability to control via hot keys or remote control. Before you start using the features and capabilities of Magic Player, you have to install this extension on the official website extensions for your web browser. For how and where, look into the "Install Extension". Once you have installed the Magic Player extension for your browser, test your player to make sure that you don’t have any problems with running and playback. To do this, click on that unique, "tiny" button that you see on this site. If you are new to the Ace Stream System and the second, but most important component (Ace Stream P2P Multimedia Plug-in) is not installed on your computer, it's okay. Whether you are first starting the Ace player, or simply clicking on sites integrated with Ace Stream, you will be offered fast, clear installation and activation steps for this plug-in — helping avoid difficulties for you. then Welcome to the technological magic of Ace Stream! The easiest way is to visit one of the websites from the "List of websites/trackers", locate interesting content, and press the Magic player button, which can be found on the release page. Seconds after pressing, your chosen content will appear in the player. To start content playback press the "Play" button in player controls, or, if the release you have chosen contains several audio/video files (i.e., an entire TV show season or music album), you can open the playlist, select files to play, set/change the order, and start the playback. For more information about player controls click "Player Controls" or use SWAG, the scientific trial-and-error method. Magic Player functions are not limited to a list of websites or trackers presented in the "List of websites/trackers". You can run online viewing/listening on almost any site that contains links to torrent-files from the context menu. Simply hover over the link or button for downloading the torrent-file, right click, and you will see the context menu list (Attention! Context menu item only works if the current link leads to torrent-file, i.e., extension ".torrent" and correct MIME-type). 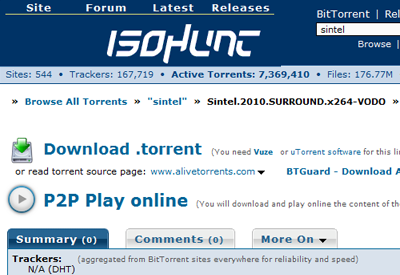 Click "View Torrent-Online" and you will find yourself on the player’s page with chosen content. At the moment there will be two basic Magic Player functions! And, this is just the beginning! The list of functions and capabilities will continue increasing, so follow Ace Stream System news by visiting this website and our forum, and don’t forget to follow us on Twitter keeping abreast of our new products before anyone else!!! Important: Before using the Magic Player, carefully read our "Guidelines and Recommendations". We understand most people enjoy simply diving into the experience, but these few minutes of your time will bring even more pleasure using products and solutions of the Ace Stream System. Please read "Guidelines and Recommendations"
Adjusting the sound in the fullscreen mode can be also performed using mouse wheel. Opening the player in the fullscreen mode, as well as exit the fullscreen mode can be carried out by double-clicking on the screen of the player. Magic Player – additional extension for browsers Mozilla Firefox, Google Chrome and Opera (extends the multimedia capabilities of many popular sites). Before you start using Ace Stream media software be sure to test its functionality, using test web player and torrent-files provided for the test. «Cache Folder» – specifies the directory of teh folder used for temporary caching of multimedia data. «Maximum download speed» - establishes a limit on the speed of download of multimedia data fron other users. «Automatically limit the download speed» - in automatic mode, the download speed will not exceed the speed of bitrate with the additional ratio 1.3 (1.3 * bitrate). «Start playback only with sufficient speed» - if the speed of downloading is lower than of the bitrate of file being played, then playback will start when the volume of the formed cache and the download speed will allow to play the file without interruption for buffering. Settings of ACE Player HD are implemented according with the settings of the original program, namely VLC player. For detailed information, please visit the developer VideoLAN site. Most of the ACE Player HD settings are synchronized with the settings of Ace Stream P2P Multimedia Plug-in. This means, for example, that if you want to enable support for hardware acceleration for web-players, then you only have to set this setting in the desktop version of the player, and it also will work for web-players. Attention! Settings for Ace Stream P2P Multimedia Plug-in will take effect after restarting your web browser. Before you start using Ace Stream media software, test its work using test web-player and test torrent files. For online playback of audiovisual content via torrents the speed of your Internet connection for the incoming traffic (download) must be higher than the total bitrate of file tracks. Optimal ratio is 1/1.3 (bitrate/download speed). You can check the speed of your connection here. Attention! The time of prebuffering depends only on the speed of your Internet connection and the total upload speed of all peers, not the work of Torrent Stream software! For example, if you are trying to play video using the torrent-file that will take one day to download with regular torrent-client, then don’t wait for a miracle from the plug-in: the prebuffering time in such case will be very long. A large number of peers do not guaranty fast prebuffering. Attention! If prebuffering lasts more than 1-2 minutes check the download speed (DL) to decide whether it is possible to watch the video using plug-in. If the download speed is lower than the bitrate speed and you do not want the playback to be interrupted, then you have the opportunity to use the option «Start with suffcient speed only» Playback will start only when the amount of formed cache and the download speed allow to play the file without interruption for buffering. When you run the file, after pre-buffering, if download speed of the stream (DL) is not enough for continuous playback, it will stop and you'll see in the information line of the player message and information about the time after which the playback will start without delays. After the specified time, playback starts automatically. Well, if the download speed is optimal for continuous playback of the file, it will start playing and continue without interruption. Video/audio is uploaded to other peers while watching and after the watching is finished if you don’t turn off Ace Stream HD. Attention! Don’t be greedy and set the maximum upload speed if you have unlimited outbound traffic. The upload speed through Ace Stream Multimedia plug-in doesn't affect the speed of loading video. If your computer has GPU (graphics processor/video card), then to reduce a burden on CPU (central processing unit), enable option «use video accelerator» in the desktop player settings (Ace Player HD, which comes with Ace Stream Media). restart your browser after enabling support for hardware acceleration to make it work for web-players. Attention! This option may not work properly with some video cards! If you decided to stop downloading or watching video-content, using web-player, then don't forget to stop downloading by clicking the button «Stop downloading» or simply close the page with the player. Install the Magic Player extension on the official site for extensions of your browser. By installing and using this Software, you accept terms of License Agreement. Attention! To use this extension Ace Stream P2P Multimedia Рlug-in must be installed in your browser! You can also install Ace Stream Media package with includes Magic Player extension for Mozilla Firefox, Google Chrome and Opera browsers. Information how to use Magic Player, on what sites a magic button or player can be found and video guide are available in the relevant sections. Ace Stream Magic Player is a P2P Online streaming at all your favorite trackers/sites!